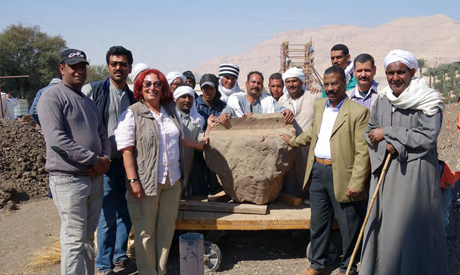 The European-Egyptian archaeological mission headed by famed Egyptologist Horig Sourouzian has unearthed a collection of quartzite blocks that had been missing since antiquity from Memnon colossi, at the entrance of King Amenhotep III's temple at Kom El-Hitan on Luxor's west bank. Egypt's antiquities minister Mohamed Ibrahim told Ahram Online on Sunday that the blocks belong to the northern colossus and depict a part of the statue's arm, painted belt and skirt. These blocks, Ibrahim went on, were missing since antiquity following an earthquake that led to the destruction of the temple, with the exception of these two colossi which once decorated the temple's entrance gate. 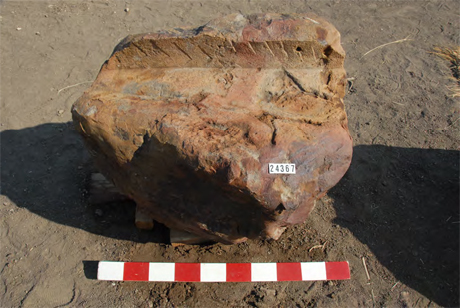 Aly El-Asfar, head of the ministry's ancient Egyptian antiquities section, said that in addition to the 88cm tall and 76cm large blocks, the mission had also uncovered others that were once part of the colossus' royal crown and foundation stone. "It is a very important discovery," said El-Asfar, adding that the discovery of these blocks will lead archaeologists to reconstruct both colossi and return them to their original glory.